Delivered in Richmond on Friday, 14 November, 2014 (approximate), during the Victorian State Election 2014. Uploaded on Saturday, 15 November, 2014 at 03:07. 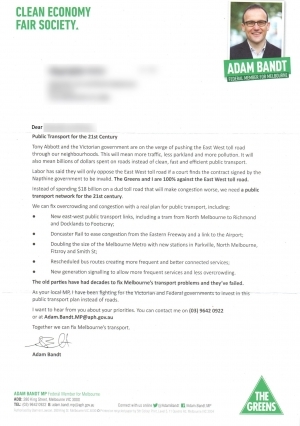 Tony Abbott and the Victorian government are on the verge of pushing the East West toll road through our neighbourhoods. This will mean more traffic, less parkland and more pollution. It will also mean billions of dollars spent on roads instead of clean, fast and efficient public transport.